For the WADEM Congress 2017 Art Show, a group of jurors selected one artist to win the Juror’s Choice Award and $500 cash prize. The jurors group was comprised of five professional artists from different backgrounds that all have experience in either curating or participating as a juror previously. The Juror’s Choice Award was based on how well the artist’s work demonstrated the concept of the exhibition to respond to or conceptualize issues surrounding global disasters and emergency situations. 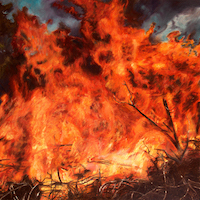 The Juror’s Choice Award was presented to Jennifer Walton who submitted two paintings, “Brush Fire” and “Conflagration.” Both Jurors and Congress delegates connected emotionally based on experiences and the dynamic presence of warmth and heat that emanated from these visceral and dramatic oil paintings. Conflagration appeared on the on the cover of the June 2017 issue of Prehospital and Disaster Medicine. WADEM would like to acknowledge the following artists for the participation the inaugural WADEM Congress Art Show! Please have a look at their personal webpages by clicking on the URLs below.